nearly immune from “political influence”, to the degree it is sometimes openly demanding such immunity. two. Replacing the existing bureaucracy with a different aristocracy, such as the old titled families of Britain, is more far-fetched; but given (somehow) the total ideological sea change that it would require, there are no practical obstacles to it functioning. Moldbug’s coining “The Cathedral” has caught on and been the subject of much debate, but his other term “The Modern Structure” less so, which is a shame. The Modern Structure is the constitution of the United States of America, in the sense that that term was originally used — a description of how the government of that country operates. Other Western Democracies have very similar constitutions. The centre of the Modern Structure is the Civil Service. They actually carry out the business of government. In theory, they are under the control of Politicians, but in reality the politicians are at most peers of the civil service, and in many cases completely subservient. In theory again, the Politicians are controlled by the Electorate. However, the influence of the Electorate is slight: enough to tip the balance occasionally when the issue is close, but not to dictate anything. Further, on any issue, the majority of the electorate are completely ignorant, and depend on the media for information about the issue and how they should vote. Meanwhile, business has at least as much influence on the politicians, and additionally has direct influence on the civil service (through lobbying and other forms of corruption). That is less than half the story, however. In the long run, what matters is not how the noisy controversies of the moment get resolved, but rather what is or is not controversial in the first place. That is the matter of the dominant ideology — what all the people in this network believe about what is and what should be. The ideology is not fixed: it has changed enormously over mere decades. Who has influence over ideology? The high status of the organs of the modern structure make them significant, but there are other important influences, and other directions of influence within the network. This diagram shows the flows of ideological influence. For this purpose I have broken out of “Education” the most crucial organ of ideological influence — “Elite Academia”. This is where ideology comes from. It is true that, in a sense, everything influences everything else. 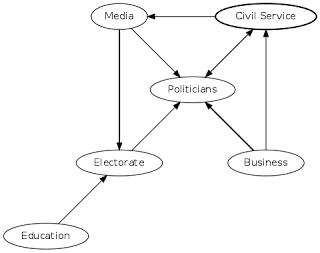 However, a fully-connected undirected graph has little information content, so the diagram only shows what I think are the biggest influences on what people believe. I have left out business from the ideology diagram. My view is that while business and lobbyists are able to significantly affect policy, they has very little influence on what people believe. They perhaps have the capability of causing such influence, but in practice businesses are primarily in competition with each other, and it is much more profitable for each player to spend his influence on favouring his own narrow interests rather than on promoting a general business-oriented ideology. To the extent that a business-oriented ideology exists, it is developed by enthusiasts, and funded more by a few eccentrics such as the Kochs rather than by moneyed interests as a whole. However, this is a disputed point, so here’s the diagram with them added back in, and with the Conservative media broken out from the respectable media. With or without business interests, it is in the network of ideological influence that we see “The Cathedral” — Elite Academia and Respectable Media — at the core. Ideology flows out from them. It should go without saying, that this is not intended to be the last word: it is my interpretation of what is mostly general knowledge, and there is a lot of room for refinement, correction and expansion.